I take it your switching the parts from the regal to the malibu. Interested in whats happening to the regal - looking to build another race car. Still has the Florida dealership sticker on the trunk. I bought it from Minnesota where it was last licensed in 2005. One charcoal gray repaint long ago. Dent and dings and small places of surface rust. As I look there is a rust through spot smaller than a dime on the driver side door panel down near the front corner. That is the only rust hole on the entire car. Original owner took body off of the frame and painted the frame and under body. Landau roof . Power windows. It has two sets of door panels and rear window panels. Gray panels are in the car. Blue panels are in good shape. All metal trim is there. Blue seats, very nice rear, very nice front passenger bucket, and darn nice for it's age front driver bucket. Excellent dash pad. Tilt wheel. Center console which I believe is complete without shifter. No carpet. Floor pans are perfectly rust free, inside and out. Original wiring harness is not installed. He made a carbon fiber dash instrument insert and purchased all new Autometer gauges to install. New front suspension parts, rotors, calipers, although they are now 10+ years old, they have not been driven on. Has new urethane front bumper fillers and new fiberglass rear bumper fillers. Headlight bezels are included. No heater or AC box. Has the 7.5" 2.41 posi rear from the Malibu installed, driveshaft and rear sway bar included. 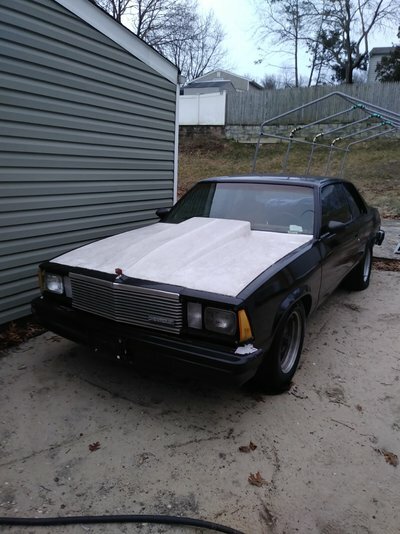 Also has a $600 2" fiberglass cowl bolt on hood. All glass is good. No fuel tank but has an aluminum fuel cell in the trunk. There are over $1000 in Autometer gauges that DO NOT go with the car. I would however sell them. I'll sell outright For $1500 with no engine/transmission or push it into the corner of the barn and do something with it in the future. Has 15x8 'ugly to me' aluminum wheels with nearly new 215/60 and 235/60 tires. Clear Minnesota title. It would make an excellent race car or restoration. Super solid 1985 Regal. That's a good looking Malibu! Welcome to the site. Thanks guys. I’m hoping to have it in Pigeon Forge at the April run. If I end up getting a steel cowl hood you'll be first in line for the ole' Harwood!